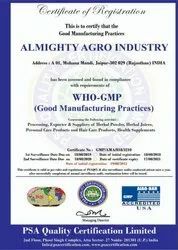 Incorporated in 2010, we, Almighty Agro Industry, an ISO 9001:2008 certified company is manufacturers and suppliers of Herbal Products, Including Herbal Juice, Herbal capsules, Herbal Health Supplement and much more. Also we offer Dried Herbs both in Actual & Powder Form. Making use of the natural ingredients, we keep providing the most beneficial products such as herbal juices, Medicinal Syrups and Beauty Products to our customers. To provide a range of best quality herbal products to our customers, we procure the ingredients from our trusted and reliable Vendors. Being associated with us for a long time, these vendors understand the precise needs. In Our Manufacturing Process Products undergo various quality checks to ensure the standard quality of the offered herbal products is never compromised. To perform these quality checks efficiently, we have a team of skilled quality controllers. For providing the best quality herbal products consistently, we have been able to cater a huge clientele. Manufacturing and Trading of a wide range of Healthy Juice, Herbal Powder, Herbal Tulsi, Aloe Vera Cosmetic Product and many other allied products. We offer a comprehensive range of services starting from formulation development to market. Our state of the art facilities are equipped to produce almost all modern dosage forms hard gelatin capsules, soft gelatin capsules, powders, liquid syrups, herbal drops, ointments, creams, gels, lotions, ayurveda and herbal preparations, nutraceutical and cosmetic preparations and many more. We offer significant manufacturing capacities. Almighty Agro have emerged as an integrated solution provider for companies seeking specific development and business goals. 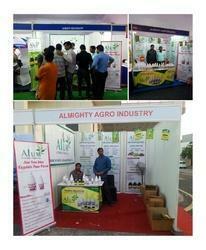 Along with its core service offering, the company offers advanced solutions for formulation development and testing. To be a globally admired Herbal product manufacturing unit, providing excellent quality products to our customers and people of the world. To dedicate ourselves for humanity’s quest for longer, healthier, happier lives through innovation in herbal medicines. To observe highest ethical standards & fair business practices and maintain highest standards of integrity at all levels of business. Each Batch of product manufactured is tested a number of times before, during & after final formulation before release. keep track of the samples of every batch carried in order to closely maintaining the defined procedures. It is the support of our hardworking and dedicated professionals that we have placed successfully a respectable for ourselves in industry. Our team carries whole operations in collaboration and ensures to meet the set targets of company within promised time. We keep employees updated with the preferences of clients, through organizing training programs on regular intervals. Our company is strongly supported by an advanced and state-of-the-art infrastructure, which is spread over an area of 20000 sq ft, developed as per GMP guidelines. Various departments includes production, quality control, administration, Research and development and more. 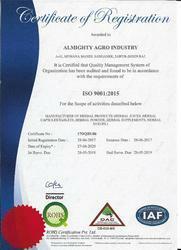 An ISO 9001:2015 certified company for Quality Management System. The Processing equipments used are made of SS 304L food grade steel. The bottles containing gel are made with unique 3 layer plastic which protects from oxidation. No pesticides are used in any phase of operation. 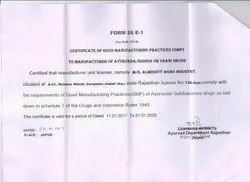 Our Manufacturing Unit is AYUSH GMP certified for its Good Manufacturing Practices at the facility. 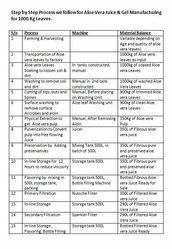 Step by Step Process we follow for Aloe Vera Juice & Gel Manufacturing for 1000 Kg Leaves. Back to Back Alum Promotion all over Place!!! 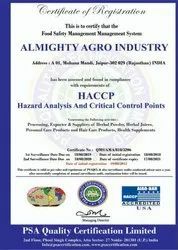 Some of them are as below…..
We are HACCP Registered Company. We have implemented HACCP in our manufacturing process.